A luxurious Castle in the heart of the Reneissance Tuscany: an open window into the history landscape, a Military Fortress dating back to the 11th century, the most ancient part is still visible today dating back to the 12th Century it was the theatre of fights between the Republic of Siena and Florence. The main porch dates back to full Renaissance Period when the Castle was transformed into a residential villa. In the same period “Velona” started being portrayed in the geographical fresco maps by Ignazio Danti preserved in the Vatican Museum. You may admire copies of them in the Castle Library. The southern side is new-medieval style which has been built in a later period. The whole Castle is an open court towards the itineraries of art. The road bordering the Castle downhill is marked on ancient maps as the Via Clodia, the old Roman road of the first Century a.C., which joined the southern Etruria to Rome. Nearby, traits of the Via Francigena are still visible, which is an itinerary run by writers, artists, famous bandits and pilgrims who, during the Middle Age addressed to Rome for the Jubilee. Near the Castle many important Etruscan archeological finds were discovered which are presently exposed in the Montalcino Museum. In 1997 the Castle had been abandoned and left in ruins for years. It was then purchased by a private entrepreneur who commissioned a total renovation transforming the Castle into a luxury Relais, keeping the original structure and maintaining the live traits of a Country House. 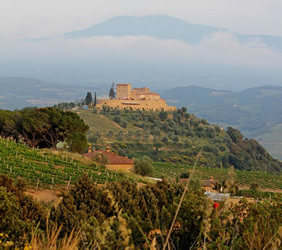 In 2011 after the discovery of mineral volcanic hot springs , Castello di Velona SPA Resort & Winery reopens its doors for guests after a three year wide renovation. , At present the Resort features a total of 46 rooms and Suites, the new Abbazia Restaurant with a panoramic terrace overlooking the west sunset side of Val d’Orcia. On top of this the 1500 sqm new SPA characterized by Mineral Hot Waters contributes to make the Castello di Velona a unique and magical place for relax, beauty, gastronomy, art and history fans and for the most passionate wine lovers. Wandering in the surroundings you can admire the romantic landscapes of Val d’Orcia (UNESCO site), visit important historical and artistic landmarks while experiencing sublime emotions: Sant’Antimo Abbey, Montalcino, Pienza (which has been built by Pope Pio II Piccolomini, as an example of a “Model City”), Montepulciano, San Giminiano, Monteriggioni, Bagno Vignoni, Monte Oliveto.